How do you make an already nutritious dip better? Guacamole, originally from Mexico, is a favorite sauce made out of avocados. 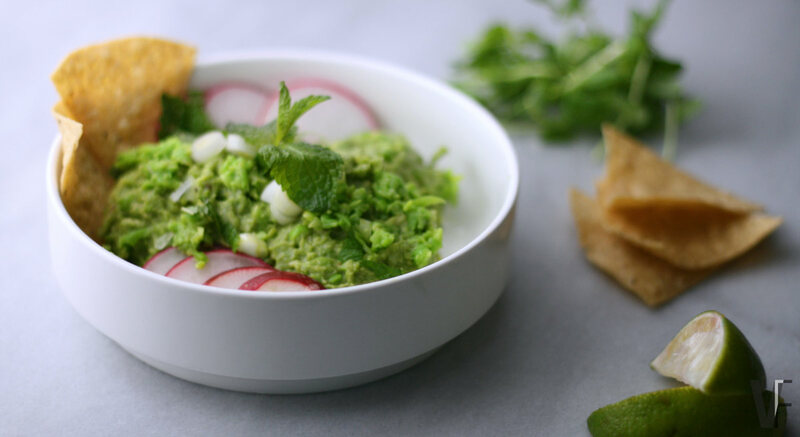 In the purest form, all you need is mashed up avocados and salt with a dash of lime to balance out the sweetness. A more contemporary take includes fresh cilantro (coriander leaves), onions and tomatoes. It makes for a perfect dipping sauce as it is not only tasty but also nutritious. Let’s start with the nutrition first. Did you know that 1 cup of green peas contains 8g of protein? That’s more than a chicken egg! Yes, I am sneaking protein in the favorite dip. I understand that for many changing the recipe up is blasphemy. Even #44 had to weigh in. So what?! Let’s still go there. Oh! One more thing, let’s switch out cilantro with mint. I am not the first person to suggest or to use mint. I heard it’s currently served at ‘The Rooftop by JG’ at Waldorf Astoria, Beverly Hills. Start with blanched peas in a molcajete (mortar). Using a tejolete (pestle) slowly grind the peas, or 😀 use a food processor. Using the combination of chop and pulse buttons on your food processor, grind the peas until finely chopped (and not a paste). In a bowl mash the avocado using back of a fork. Mash it to the consistency you prefer. I prefer chunky bits of the fruit in my dip. Mix in salt, pepper, mint, onions, lime zest, jalapenos, and lime. Garnish with pea sprouts or radishes. Serve with chips or tortillas.